Darjeeling: The Beautiful Game is making one of the most beautiful hill towns in India even more beautiful. The FIFA World Cup fever has gripped Darjeeling like never before and the town, where football is a definitely bigger than cricket by yards, is ready for the showpiece event. Citizens of the town have self-christened the place as Darjeeling-The World Cup Town 2018 and lined up a series of events to celebrate the mega event. Underlining a message, Deven Gurung, the president of the Darjeeling North Point School Alumni Association (DNPSAA), said: "The Herculean task at hand is to establish to the rest of the world that peace and normalcy have returned to the Queen of the Hills. The future of the town in different respects, including tourism and education, depends on this." "We chose to use the world cup football tournament for this. Football being the heartthrob of Darjeeling, we are transforming Darjeeling into a World Cup Town from June 2." The alumni of one of the most prestigious schools of Darjeeling, St Joseph's School, and other citizens of Darjeeling are coming together for the grand celebration. "We will celebrate by holding a day long carnival on June 2," said Gurung. Never-heard events will be taking place in Darjeeling this time around. "We will organise a football parade, a cheer-leading competition, garage sales by Shanker Foundation (an organisation of HIV positive people), Dance Fiesta by Edith Wilkins Street Children Trust and many more," said Gurung. The "many more" include a bike and Scooty rally from Kurseong by MARG (an anti-human trafficking organisation in Darjeeling), mountain bike rally, cosplay, B-boying, face painting, nail art, hair do, musical performances and beat boxing. There will also be an award for the best decorated area of Darjeeling (with a World Cup theme) at the end of the World Cup tournament. Celebration is not just being confined to celebration and fun. The DNPSAA, along with a leading nursing home in Darjeeling, will flag off a unique project--- Clinic on Wheel, aimed at providing medical facilities in far-flung areas of Darjeeling. The Beautiful Game is making one of the most beautiful hill towns in India even more beautiful. 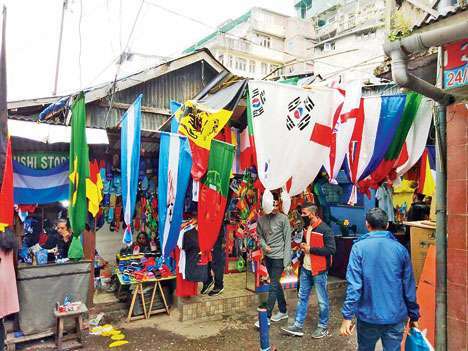 The FIFA World Cup fever has gripped Darjeeling like never before and the town, where football is a definitely bigger than cricket by yards, is ready for the showpiece event.